I continue to monitor the 10 year government bond yields of three countries (Australia, United Kingdom and the United States) to try and understand when interest rates may start to rise with my datasets shown in today’s chart. 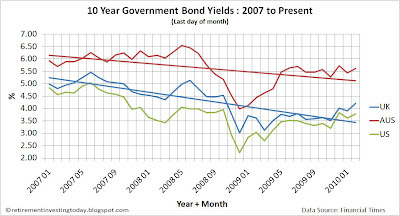 Since June of 2009 the 10 year Australian bond prices have actually fallen by a relatively small 0.5%. In contrast the US 10 year has risen by 7.4% and the UK 10 year by 13.8% to be 4.20% today. Reason 1. The Bank of England have now made clear that they are going to hold interest rates at 0.5% even though inflation is well above target. They have even mentioned that they could yet perform more quantitative easing (QE) which must be inflationary. In the letter to the Chancellor the Bank of England claims that ‘the direct effect of the short-run factors on inflation should be only temporary’ and that ‘although it is likely to remain high over the next few months, inflation is more likely than not to fall back to target in the second half of the year...’. I can’t help but feel that the Bank will ignore their inflation target of 2% and that it’s a case of do as I do not as I say given that the Bank of England’s pension fund has 88.2% of its assets devoted to Index-linked gilts. The market is starting to think the same thing and so to ensure a sensible real (after inflation) yield the prices have to fall and yields rise. Reason 2. Alistair Darling has forecast government borrowing to be £178 billion. On Thursday last week yet another record was set when it was announced that in a month when tax receipts usually flood in the government still had to borrow £4.34 billion. This is the first time since 1993 that the government has had to borrow in a January. Punters are now starting to suggest taht at current trends the government deficit could be £10 billion more than forecast. Supply and demand principles should hold. More supply of debt for purchase should reduce the price of debt. Reason 3. The UK government are still yet to explain how they are going to reduce the levels of borrowing. The levels of borrowing are heading to 13% of GDP and may even exceed that of Greece which we have seen so much of in the press lately. How long until the credit worthiness of the UK is downgraded. This will depress prices meaning yields will have to rise. Reason 4. Those who already own government bonds and can see what’s happening will start to sell their holdings. This combined with the Bank of England now out of the market and no longer buying debt through QE has to reduce the number of buyers. Again supply and demand should prevail pushing yields higher. So what does this mean for my retirement investing strategy? Exactly where I was last month. If I owned gilts I’d be considering selling. I don’t own fixed interest gilts so I’m ok here. I do own index linked gilts but with inflation kicking off I’m comfortable with this and following the Bank of Englands pension fund. I also will continue watching house prices carefully. The interest rates on mortgages have to rise as those wanting to borrow for a house will effectively be competing with the UK government for funds. I can’t see how house prices can continue to rise with increased borrowing costs and this could turn out to be the catalyst that brings on a reduction in house prices.